The TF2 comp did not run that smoothly without you there ST. Waiting about 20 minutes for an admin to change the map or use the correct configs was annoying. Once that was sorted though it was good fun. A close competitive final, which was only 1 map also for some reason. 'Spose we didn't care at that point since it was 2am after all the delays. First LAN down, had fun. But next time comrade lost should turn up with more than 2000 hours. What an absolute shitter. TF2 should of ran smoothly, sorry about that. CS:GO AM servers broke due to an update early Saturday morning. I was fixing it remotely and we had to wait for Valve to release a fix. Basically it broke Ubuntu servers which is what we use. Bit of a necro, but any educated guesses on the dates for Christmas LAN? Spoke to some_thing, he says the lan was moved by 1 weekend cuz of venue issues. So there is going to be a lan in december, just waiting on dates to be confirmed. Last edited by myri; 7-11-2014 at 13:07. 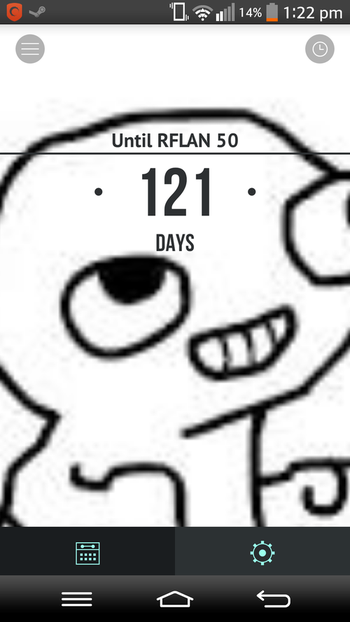 RFLAN, coming soon in 720P! not even hd, let alone 4k. so no lan in december? apparently they're making BIG ANNOUNCEMENTS for this event so maybe it'll be worth the wait, but srsly... april??? RFLan - Redflag Lanfest "We wanted to take the extra time to do this right, and do it at a time everyone can still attend (ie during uni breaks etc). We are planning lots of big annoucements for this event so stay tuned. Don't worry, we wont be staying quiet leading up to the event"
So RFLAN 50 will be in April 2015. This happens to coincide with our 15th year of running events, and also a nice round number of 50 events so we are going all out this event. Heaps of stuff being announced between now and then. So to clarify there is no December event as we are taking extra time to make our anniversary event huge! We plan to have massive prizes, giveaways and really make a scene of it. I can't reveal much at the moment but we will be running some online tournaments in the lead up to the event and I plan to have one specifically for TF2 There will also be other gaming events hosted by RFLAN leading up to number 50. Sorry about the deception SV, I had to keep it under wraps and I wasn't expecting you to post about it. We've been wanting to do this for a while and we finally crossed off all the niggly annoying bits to finally say we can now do it! So to clarify there is no December event. Online tournaments sound cool though. Keen! Disappointing that the Christmas event is being skipped this year but I'm sure there are good reasons. Was hoping to catch up with a few of you! Any idea when these online comps and announcements start??? So, was the summer cup the "online tournaments" that were teased?